When a meat eater frequents a vegan restaurant, it must be outstanding. I had just about every local tell me to go to this restaurant, not because it was vegan, but because they love the food. 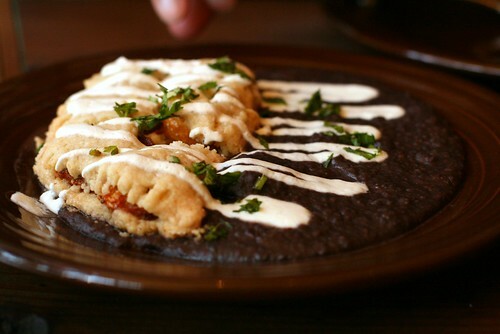 This 100% vegan organic mexican restaurant doesn’t skimp on the ingredients or the dining out experience. Everything was well priced, fresh, portioned well, and beautifully assembled. It was hard to choose what to eat because every dish was unique. 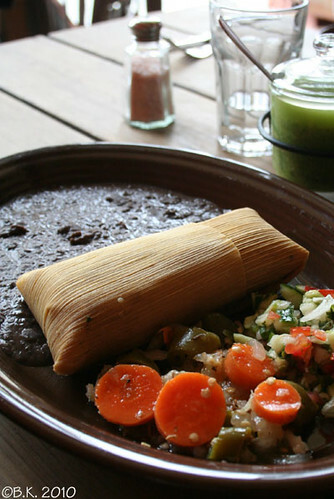 From Prickly pear cactus to posolé, every dish had to be made to order and was a far cry from a burrito shack. I basically had no option in my decision, I was told that the tamale was a favourite and I would regret not trying it. Using stone-ground heirloom masa and fresh escabeche (spicy pickled veggies) I didn’t want this tamale to ever end. I truly see this restaurant as an inspiration for future vegan ventures because of the homemade, fresh aspect this restaurant embodies. To top it all off, they make their own corn tortillas and cashew cheese in house. You could say that I am biased toward New Mexican/Mexican food and that’s why I am giving this restaurant such a good review, maybe, but the food was excellent, the service was professional, and the atmosphere was full of wood, tile and dimly lit tables. The tables were large and meant for two parties to dine at, bringing together different types of people for at least one meal. Dinner also included an authentic mariachi band, something that I have only yet experienced in New Mexico. If you are ever in San Francisco, whether you are vegan or not, Gracias Madre is more than worth your time. Actually, maybe you should book a flight to San Francisco right now and go for dinner. This entry was posted in Restaurant Reviews, San Francisco on September 27, 2010 by kaylie.